Welcome to The Bromfords School and Sixth Form College. Our school is a ‘Good’ school and our intention is to be a great school. It is a school of which we are all very proud. Our students are our greatest asset. They continue to achieve academically, they excel at the multitude of opportunities that we offer and they are superb ambassadors for us, both in and out of school. Continue reading…. The Bromfords Sixth Form College is a growing community in excess of 150 students offering a supportive and inclusive learning environment. Our Sixth Form prides itself on offering students a bespoke curriculum tailored to their individual needs. Our personalised approach means that we can support students to progress to their next stage of education, employment or training, allowing them to achieve their maximum potential. The primary aim of the Sixth Form is to enable our students to develop a lifelong love of learning whilst becoming caring and active citizens in our local community. The Bromfords School and Sixth Form College is committed to safeguarding and promoting the welfare of all its students. We recognise that all adults, including temporary staff, volunteers and governors, have a full and active part to play in protecting our students from harm, and that the child or young person’s welfare is our paramount concern. Our website is designed to provide key information for students, parents and carers. It also aims to give a flavour of ‘life’ in our school. See below for more information! The school’s latest exam results and schedules for internal and public examinations can be found here. Students are ambassadors of the school and are expected to dress and behave in a way that reflects the standards we seek to achieve. All students in Years 7 to 11 wear school uniform. The Bromfords School and Sixth Form College is an inclusive environment and aims to meet the needs of all SEND students, click here to find out more information. Information on the curriculum for the main school and sixth form can be found here. safe and able to express themselves. 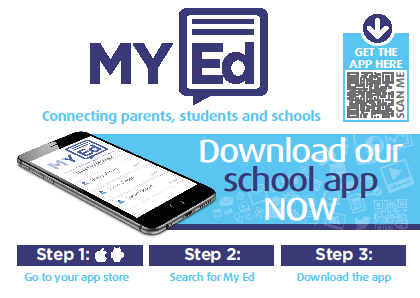 We are pleased to be able to inform you that the school are now using the My Ed app to further improve our communication with you. You can download the app now from either the Apple Store or Google Play. Once downloaded to your phone, search for our school by typing the word bromfords.